As a crochet blogger, I often get asked "how did you start designing patterns". My answer? I just decided one day to try it! Today's free pattern is a remake of one of my earliest free patterns, the Open Air Market Bag. Why a remake? 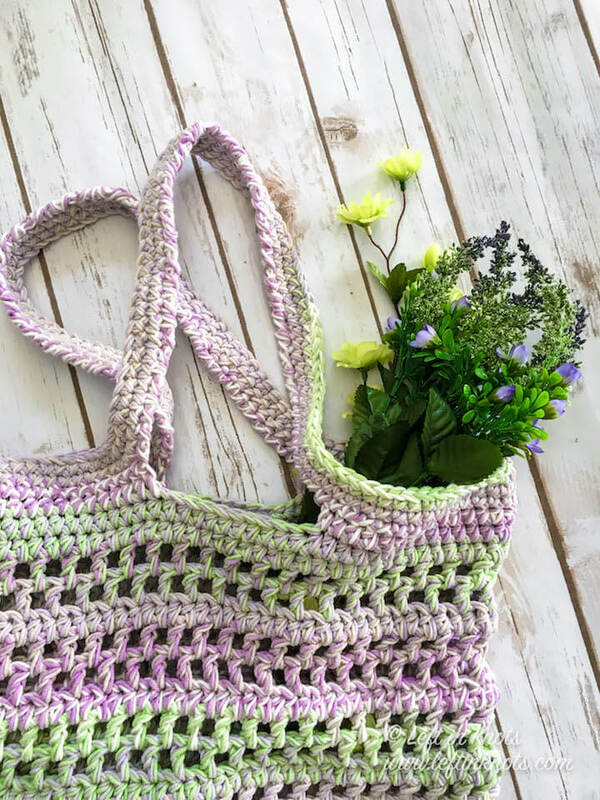 Well...just keep reading to find out and then enjoy the free crochet pattern for the new and improved Lavender Fields Tote Bag. During the course of my blogging adventure, I have learned and improved my design skills and have developed my pattern writing style. However, some of my original patterns were a bit....rough. I loved them then, and still love them! But back in the day I made some common errors in my designing and writing (like forgetting to figure out the amount of yarn required, proving final measurements, providing a gauge, etc.). My original design for the Open Air Market Bag was missing some of this information, and from a design standpoint my yarn choices maybe were not the best. I love the style of the bag though, and when Caron Cotton Cakes was re-released this spring, I knew I wanted to re-make the bag with it! Height of bag without strap: 15.5"
Height of bag with strap: 25"
This pattern is worked with double strands of yarn. To get the fun color mixing, I intentionally made sure my skeins were at very different points in the color changes from each other. Round 8: Ch 4 (counts as first DC and ch 1), skip 1, *DC, ch 1, skip 1. Repeat from * around (you will have 40 ch 1 spaces), sl st to the 3rd ch of the beginning ch 4 to join. Round 27: ch 2, HDC in 15, Ch 50, skip 10, HDC in 30, Ch 50, skip 10, HDC in 15, join to first HDC with a sl st (160). Round 28: ch 1, SC around, working 55 SC into the ch spaces for the handles. Join to first SC with a sl st (170). Round 29-30: ch 1, SC around, join to first SC with a sl st (170). At the end of round 30, fasten off and weave in ends. Need more bag inspiration? Try my one skein Star Pop Bag!